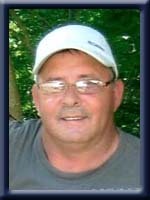 MILLER – Kevin George, 50, of Milton, Queens County, passed away suddenly at home on Friday, April 20th, 2012. Born in Liverpool, he was a son of the late Virginia (Whynot) Miller and George Foster. In his early years, Kevin enjoyed playing baseball, bowling and playing cards with his friends. Over the past few years, he loved spending time with all his buddies, whether it was going for short drives, meeting for coffee or just visiting. Most of all, he loved spending time with his family. He is survived by his wife and companion of 28 years Joanne MacLeod. His son Christopher, his daughters Tiffany and Tasha (Dillon Conrad) and his granddaughter Isabella, his pride and joy. His foster mother Shirley Whynot, his stepmother Jessie Foster, his sisters Kelly (Richard) Young and Shelley (Shane) Goulden. Half-brothers Steven (Sonya) Foster and Larry (Gina) Foster as well as numerous uncles, aunts, nieces, nephews and cousins. He was predeceased by his foster father Lawrence Whynot and his sister Vera “Honey”. Joanne,Tiffany,Tasha, Bella and Family….so to hear about the loss of Kevin. my prayers and thought goes out to you at the differcult time! Dear Joanne, I am so sorry of your loss. My deepest sympathy to you and your Family. I remember all of us going to school together. My prayers and thoughts go out to you. Our thoughts are with you all. It has been a long couple of days for us. To think he was just here Thursday night playing hockey with Brogan and I, and was so happy and full of energy. It makes it so hard to believe that he is gone. I really enjoyed the times we went for drives because everyone was a new experience and a laugh. I am here for all of you. Call me anytime. Kevin was not just my cousin he was a great friend. Love you all. HUGS from all of us. Joanne and girls , I was shocked and saddened to hear the news about Kevin. My thoughts and prayers are with you at this difficult time.This is a time that is always hard but you are a strong family . So sorry to hear of Kevin’s sudden passing. Remember the good times, and let them get you all through this sad time. It’s never easy, that’s for sure. remembering you and the girls at this sad time. My thoughts are with all of you during this very sad time. My thoughts are with you guys……its never an easy time that’s for sure……..but may the days ahead bring you all peace. Our hearts are filled with sorrow for you and your family. Daddy, I love you so much & It is gonna kill me knowing you aren’t here anymore to cheer me up when I am upset, You use to pick on me until you saw that smile on my face. I’ll miss you doing that, and I miss you forever & always. I love you, xoxo R.I.P. Daddy! P.S. thanks for all the support everybody our whole family appreciates it. Joanne, I was so shocked and saddened to hear the news about Kevin. My thoughts and prayers are with you and your family at this very difficult and sad time in your life. I have known Kevin for long time. Remember the good times and it will help you get through this very difficult time. I thinking of you Joanne. Sorry for your loss. We are all still in shock with the news. May you be strong and remember all the good times u had together. Mark sure misses his chats with Kevin in behind Tim Hortons and when Kevin would walk by the building. Take care and know you are in our thoughts. Sorry to hear about the loss of your Father. May God give you the strength to deal with your loss. You all are in my prayers. Words cannot describe how heavy our hearts are for you all. It is a terrible loss and he was greatly loved and will be terribly missed by all. Kevin had a way of making everyone smile and laugh and i will never forget that. Just know that he will always be with us and looking down on us and you especially. The memories we have of him will last a lifetime. To Kevin’s Family… My thoughts and prayers are with you at this difficult time. Kevin was one of the first students I taught. Rememberig some of his ‘antics’ always brings a smile. Whenever I saw him, he was sure to say hello. RIP Kevin Miller. So sorry to hear about your brother.Our thoughts and prayers are with you! Take care! HI Joanne, Shelley and family – I am shocked and saddened to hear of Kevin’s passing – I remember him when Shelley and I were younger …always there. Although it has been more than 20 years, I still remember. My thoughts and prayers are with you all as you go through this tough time. God Bless. Bonnie (Smith) Conrad, Halifax, N.S. So sorry to hear of your loss. My thoughts & prayers are with you all. so sorry for ur loss and hope u can go on with all ur memories of kevin i no i will he was a good friend and scott and i will miss him dearly.we had some good old laughs and some seriouse talks and i will miss him so much .RIP kevin RIP.MISS U….. So sorry to hear of Kevins passing. My thoughts are with you all during this most difficult time. I am very sorry to hear your love one. My prayers go out to the whole family. Kevin was a nice person that I known, and when I saw him walking I all ways say hi to him. Keep the memories going for what he has done for you all. Kevin is always in your heart and he is looking down on you right now. Kevin love you all. So sorry to hear of your loss.He is an Angel in Heaven now,watching down over his family. Kelly, so sorry to learn of your brothers passing. So sorry to hear of the loss of your dad. You and your family are in my thoughts and prayers during this difficult time. May memories of happy times give you comfort. God bless.